On a gray December afternoon, the members of the Lake View High School Debate Team aren’t hurrying home or dreaming about the upcoming winter break. They’re gathered in Coach Daniel Bender’s cheerful classroom, passing around peanut butter cookies and discussing strategy for an upcoming competition. The team’s practice is alive with conversation. Freshmen and seniors alike quiz, challenge and talk over each other. They toss around words like “hegemony,” “solvency,” “counterargument,” “neoliberalism,” “institutional racism” and “nihilist” and nimbly discuss current events and specific state and federal policies. Coach Bender, a first-year teacher, started the team at the beginning of this school year and heads it up along with Coach August Wissmath. Both have backgrounds in debate and mock trial and felt Lake View students would benefit from the activity. 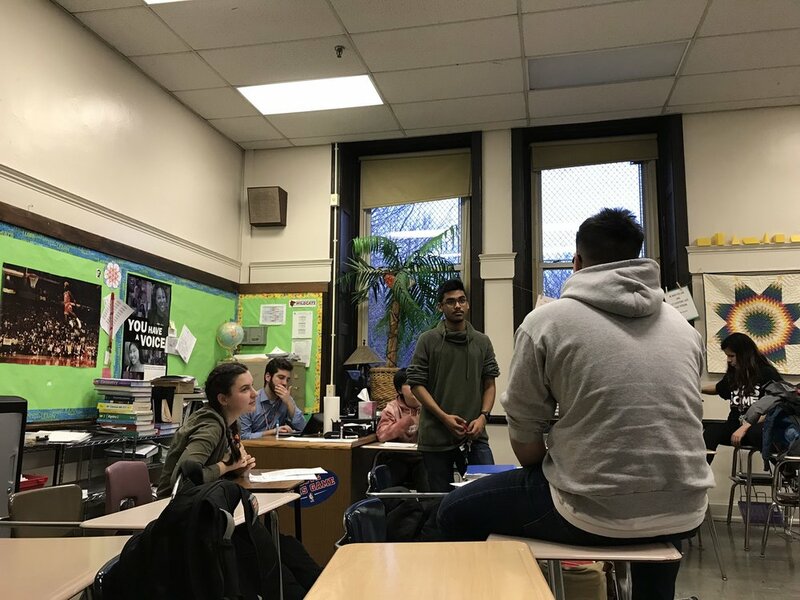 This year, the team will compete in at least five tournaments, preparing for a single event called “Policy Debate.” This challenging event requires competitors to understand, in detail, both affirmative and negative arguments for a particular policy proposal. In competitions, students speak in 5-to-8-minute increments about the topic, alternating with their opponent, and endure a cross-examination of their arguments. The structure of the event necessitates that they speak extemporaneously and at length, exploring their topic from all angles and responding to their competitors in real time. At an early tournament, the team placed eighth out of a field of about 25. At another competition, one of their particularly dedicated freshmen won the “speaker award,” placing first in a field of about 60. And at their most recent debate, two of the Lake View debaters placed in the top 16 in individual speaker awards and as a pair came in third overall out of 30 teams. Bender and Wissmath coach students to understand, inside and out, the core concepts they are asked to discuss—no rote memorization of talking points for this team. 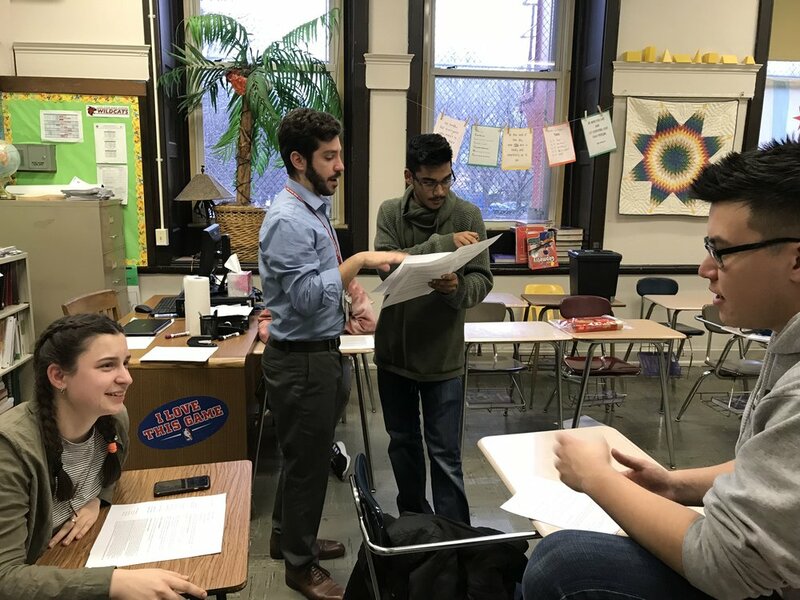 At one practice, for example, Wissmath worked with students to prepare them for a debate on a proposal to devote more funding to vocational training programs. He quizzed each student on federalism, asking for a definition, for details on specific aspects of the philosophy and for reflections on how it would play out in specific circumstances. In moments like these, team members are asked to think on their feet, to be prepared for any question at any time. When they falter, they’re corrected, encouraged and helped along by the others. The coaches and students alike also puzzle out difficult concepts and approaches together, as equals, tackling the tasks of building knowledge and deciding on a strategy. There’s a feeling in the room that everyone has both something to contribute and some way in which they can improve. The students themselves point to a variety of reasons for joining the team. Many feel that Debate Team prepares them for college and career. Understanding current events and politics, thinking on one’s feet, quickly and accurately identifying the most important points a speaker is making, and expressing oneself articulately under pressure are all skills honed at each practice and every competition. At the same time, they express a deep enjoyment of the activity, and their investment in the team is obvious. One student explained how she squeezes in Debate Team among a full schedule of after-school activities, including track and field and martial arts. Others specialize in Debate, throwing all of their extracurricular weight behind it. Whatever their other commitments, no one at practice is in a hurry to leave, and the team is absorbed in its work. The students stride around the room. They write ideas on the blackboard, work together to untangle difficult concepts and refine their phrasing. They propose extra practices and nudge a busy student, making sure she plans to attend the upcoming tournament. Bender pulls out a relevant newspaper article, and they huddle around, teasing out its meaning and implications. When the coaches end practice, no one leaves the room; they all hang out, chatting and joking. “We’re like family here,” one team member tells me. The Lake View Debate Team exemplifies the wide-ranging benefits of high school extracurricular activities. It’s one where intellectual curiosity and social awareness are valued. Where demands are high but members can struggle and make mistakes and improve in a warm and encouraging environment. Where students push each other, but have fun. Where a serious conversation about racism is lightened by a wadded-up piece of paper lobbed alley-oop style to the trash can. And where coaches skillfully guide students to consider how high-level societal debates play out on the ground-level, for young people like them. It’s the kind of place we all wish we had in high school – where students build relationships with each other, develop the skills that will serve them as they move into adulthood and have the space and guidance they need to think through the big, important ideas that will shape the world they live in. Brady K. Jones is an Assistant Professor of Psychology at The University of St. Francis in Joliet, Illinois. She lives in Ravenswood with her husband, two children and exuberant dog. Brady loves traveling, reading, movies, coffee and the city of Chicago.